What sets the Rideau apart from other lakes and river systems is its rich history. The oldest continuously operated canal in North America, the locks work today much as they did when first opened in 1832. The canal, built in a wild frontier of lakes, rivers and swamps is an engineering marvel and a testament to human genius, sacrifice, and perseverance. The Rideau was a sparsely populated frontier when construction of the Rideau Canal first started. In some places, water power of rapids had been tapped for saw mills, grist mills and carding mills. A few small communities were in existence, but most of the settlement was in the form of widely spaced farms, laboriously hacked out of the forest. A few rough roads connected some of these communities. Construction Camp at Brewer's Lower Mill, 1829 This painting shows a typical Rideau Canal construction camp. The site has been cleared of trees to help prevent malaria. On the right, rough cut stones are ready to be finished by the masons. The meandering nature of the Cataraqui River is evident as is the width of forest cleared for the future navigation channel (the river will be flooded by the dam at Kingston Mills). The lock pit is being dug with picks and shovels, the waste material being removed using wheel barrows. "Brewer's Lower Mill; View down the Cataraqui Creek, & and Clearing made for the Canal. 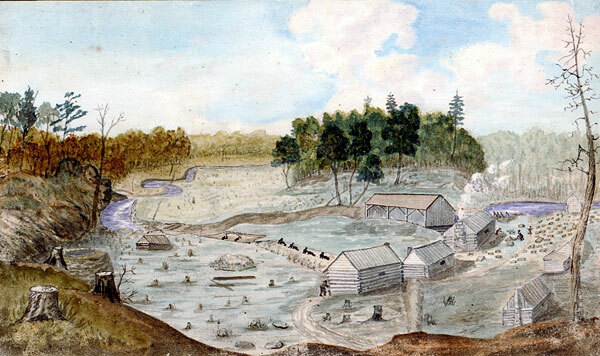 Excavation for the Lock just commenced, 1829" by Thomas Burrowes, 1829, Archives of Ontario, C 1-0-0-0-67.